MPPS-2 е опростен микропроцесорен манометър с m-bus интерфейс. Предвиден е да измерва налягане чрез свързване към трансмитъри 4-20mA. MPPS-2 има два независими измервателни канала и общ m-bus интерфейс. Всеки вход е с уникален първичен и вторичен m-bus адрес. Тъй като често трансмитърите за налягане са пасивни - MPPS-2 е с автономно захранване от мрежата 230 VAC. Данните от трансмитърите се преобразуват в налягане от 0 до 16 bar-a, с точност от 0.01 bar. Уредите се настройват при нас фабрично на отместване и линейност, но ако се налага може да се прави корекция през m-bus интерфейса със специални телеграми (manufacturer specific). уредът има защита от късо съединение и на двата си входа, захранването и m-bus интерфейса, което го прави трудно за повреждане. Монтира се на стандартна М36 DIN-шина. 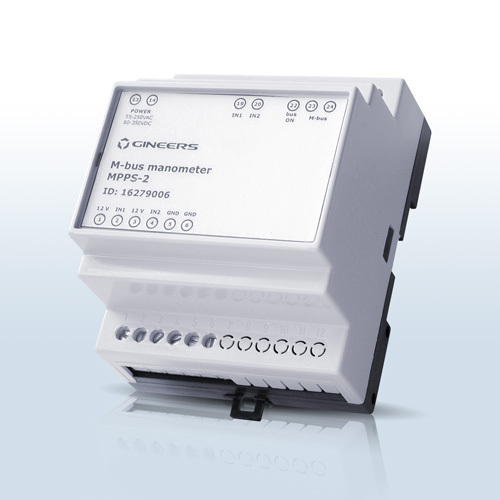 МPPS-2 are simplified 2-channel manometers, intended to be connected in m-bus network. These devices do not have display and keyboard, but can simultaneously measure current 4-20mA on two separate channels and transform it to pressure. Device is designed for measuring from passive 4-20mA pressure transducers, that is why it has autonomous switching power supply inside. All devices are factory calibrated with reference current generator. However, there is a possibility user to carry out his own linear correction for a particular sensor. This is made with special m-bus telegram and can be done with Gineers software. According to m-bus device complies with basic m-bus telegrams (like SND_NKE, RSP_UD2, primary and secondary address change, etc.) and is two m-bus loads for the master converter (3mA). There is no backup battery because there is no point, since MPPS-2 returns only actual and instant measured pressure. Further processing of the data (like timestamps, etc.) should be taken from master device. Status of the inputs is signaled with two bi-color leds. They has three conditions - green (all OK), yellow (sensor not connected) and red (short-circuit). Presence of m-bus is singaled with additional standard LED. 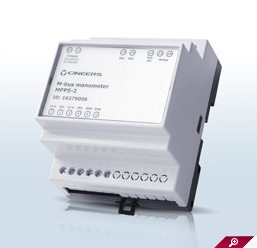 All inputs are protected against short-circuit - signal inputs, m-bus and power supply. Device is mounted on a M36 DIN-rail. Device complies with standard m-bus telegrams due to EN1434-3. It has one primary address and one secondary address. They can be changed with any m-bus configuration program, which follows m-bus standard. Description of m-bus telegram and code fields can be seen in m-bus description, downloadable from our site.